Portland Bites — Day One | Eat.Drink.Life.Love. We have returned from our epic Pacific Northwest journey! We had an amazing vacation, got to see lots of friends and sights, but it was primarily epic because of the sheer amount of great food we managed to consume. As with every vacation, we try to seek out the best a city has to offer, food that’s truly representative of where we’re visiting and tastes we can’t get at home. Our first stop on this vacation was actually Las Vegas where K’s annual family reunion is held. After the banquet with the fam and bowling tournament fun, K and I enjoyed dinner at Scarpetta, chef Scott Conant’s Italian fine dining restaurant in the Cosmopolitan. We didn’t take photos because the low, romantic lighting was not photo-friendly, but should you make it to a Scarpetta outpost, do indulge in the creamy polenta with truffled mushrooms and the signature spaghetti which was simply the best spaghetti I’ve had in my entire life. The secret is fresh pasta, lots of butter and to finish cooking the pasta in the sauce (not pasta water). From Las Vegas, we jetted off to Portland and, because of a plane delay, arrived late. We took the light rail from the airport to the apartment we rented smack dab in the middle of downtown Portland (TOTALLY recommend AirBNB). I’m typically a freakish planner when it comes to vacation activities, but we were on the “no plan” plan this night because we didn’t want travel delays to mess up any potential restaurant reservations. So we were on the lookout for late night dining on a Sunday night. Thank goodness for Higgins! 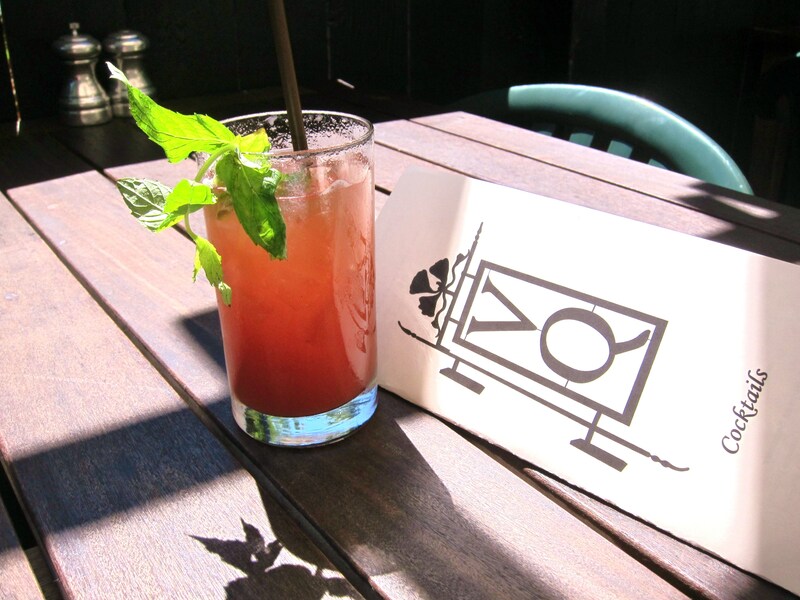 Local, seasonal and creative — even in the bar! Cradled in low light and warm wood, Higgins felt like the neighborhood watering hole, but with much, much better food. There was a local sandwich competition happening and the chef created a Reuben sandwich available for a very limited time. 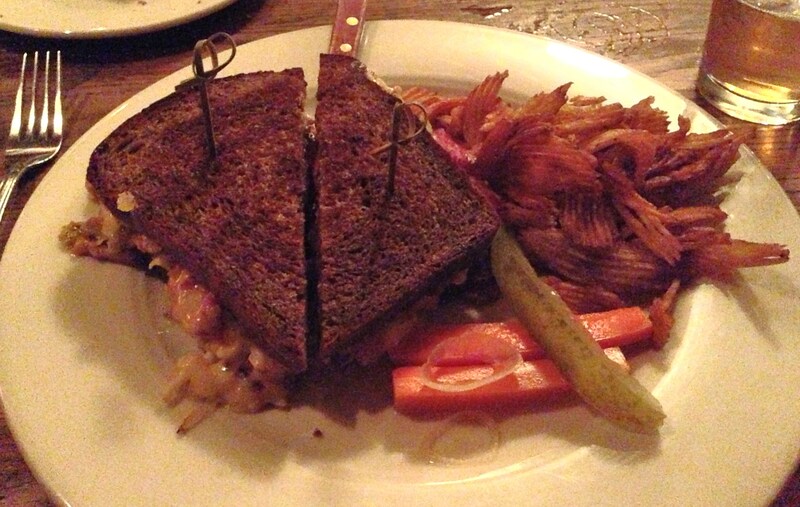 K jumped on that and was rewarded with the most delicious Reuben known to humankind. Homemade Guinness stout rye bread, house pickled sauerkraut (“We can pickle that!”), house made pastrami and caper aioli with a side of thick cut homemade fingerling potato chips. I do not generally like Reuben sandwiches because they’re messy and the flavors are overwhelming, but this sandwich was so sweet and crisp and creamy and meaty and in balance that I wanted far more than the one bite I stole. Hungry, I tossed having to live “gluten-lite” to the wind and ordered the rigatoni with fresh little bay shrimp and saffron broth. It was very, very good — a hint of exotic saffron with sweet pops of shrimp — but it honestly paled in comparison to that gorgeous sandwich and those amazing potato planks. 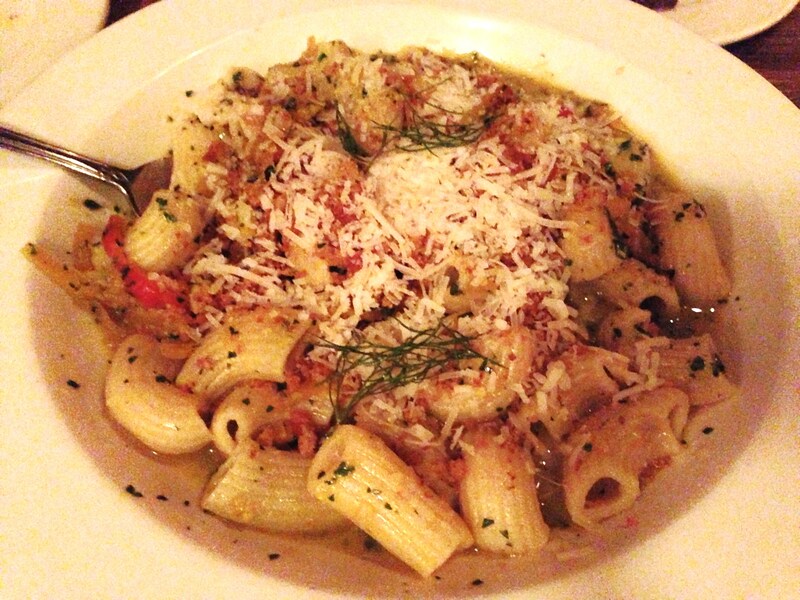 And with pasta this awesome, that’s saying a lot. 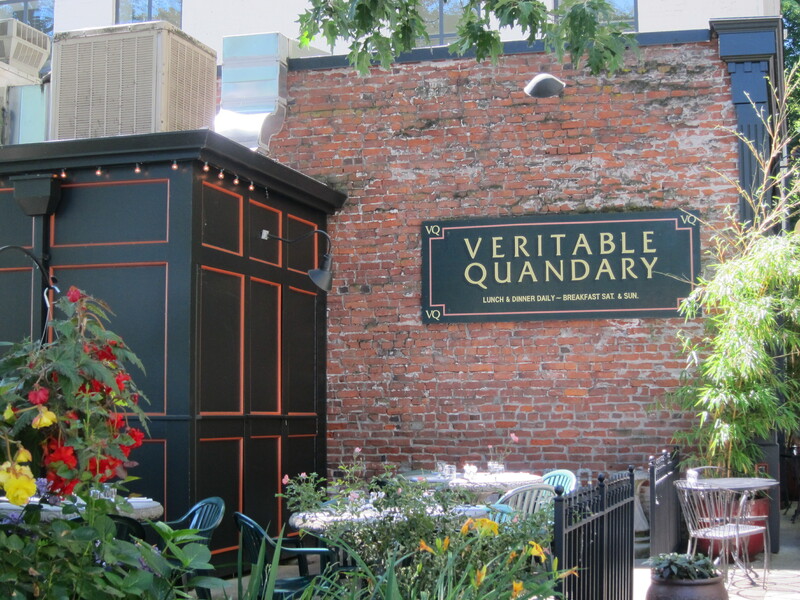 On our first full day in Portland, we walked through downtown and headed to the charming Veritable Quandary restaurant where we were welcomed for lunch under the pergola and amid the gorgeous blooming flowers on the sunny patio. Urban oasis, first full day of vacation, leisurely lunch — all those things say “cocktail” to me. So I went with a strawberry, basil, Prosecco concoction and it was sweet, herby, bubbly gorgeous and delicious and I loved it. My eyes were itchy after my gluten-indulgence at Higgins the night before so I needed to ditch some wheat. With that in mind, I ordered the pulled pork sandwich on greens instead of bread. I’m going to start ordering more sandwiches on a pile of greens, I love it! This was so good and a great way to fuel the rest of the day. Tender, tangy pork swimming in well-seasoned tomatillo and green chile sauce with crunchy little pepitas, cool queso fresco and that hot, crispy pile of fries. 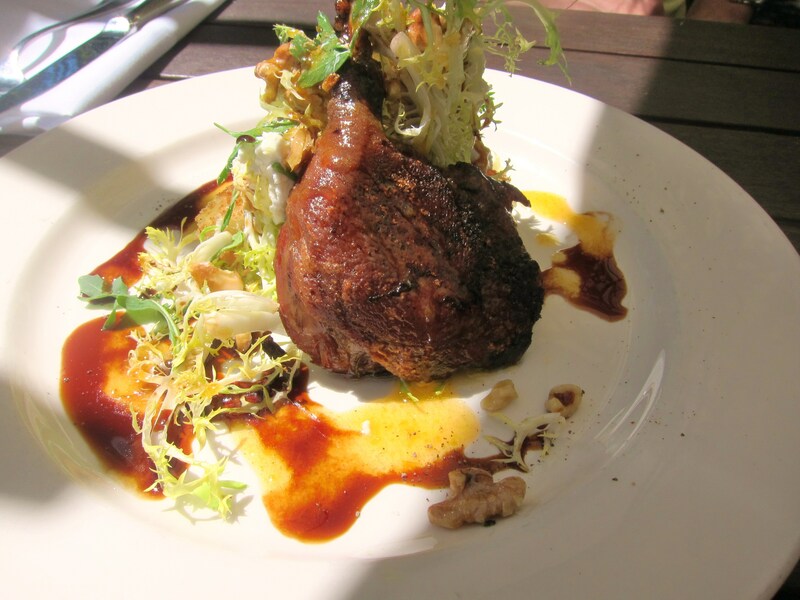 K ordered the duck special that day that included fall-off-the-bone duck confit. Perfectly done, not at all gamey. Delicious. Those little crunchy, slightly bitter walnuts were the perfect complement. We walked across the bridge to the Oregon Museum of Science and Industry and explored the incredibly interesting Mummies of the World exhibition and played with everything from a Theramin to a computer that allowed us to type with our eyes (which is VERY hard to do). We walked along the esplanade and stopped to get our bearings (K looked at Google Maps on his phone while we sat in front of sidewalk chalk art that read, “All who wander are not lost.”). We stopped back into our apartment to clean up and change for dinner with friends. It was there I realized we’d been in the sun for *hours,* and that I am a very pale person who didn’t think to wear sunscreen. Thank goodness I was only slightly sunburned, but we’d walked for miles in the sun and the temperature was in the beautiful upper 80 degree range. I felt pretty gross, but rallied for our time at The Farm Cafe. 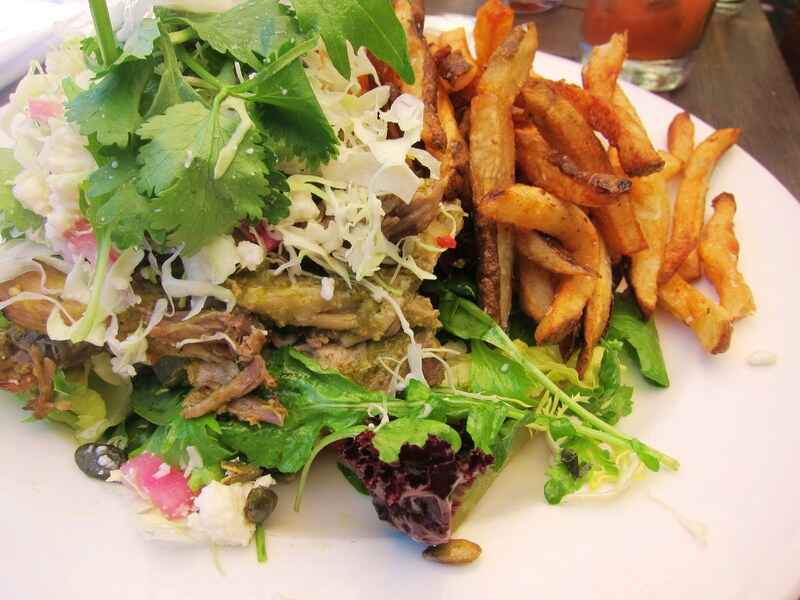 Set in the close-knit quarters of an old house, The Farm Cafe is adorable and embodies Portland’s “farm to table” food philosophy perfectly. We caught up with our friends Jim and Jen (who is the proprietress of the astonishingly beautiful and pitch perfect blog Honey Kennedy) over squash blossom fritters, bubbles, melty baked Brie and more. 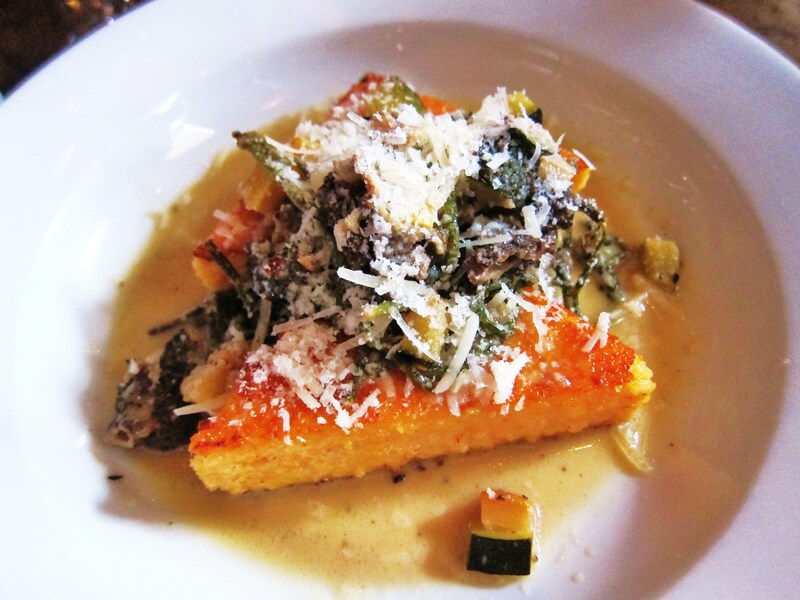 My eyes were bigger than my stomach this day, so I only nabbed a few bites of everything, but my polenta cakes were creamy and substantial with a lovely seasonal veggie ragout. 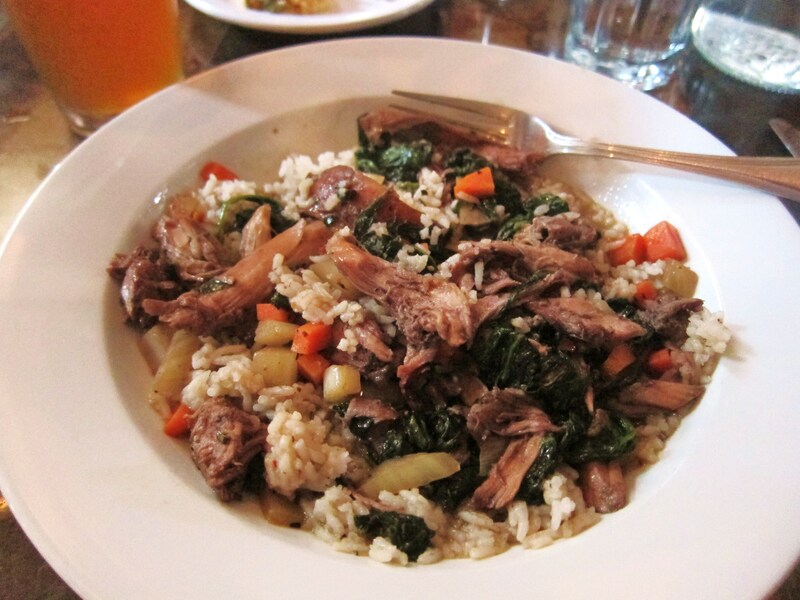 K really enjoyed the rabbit special with seasonal greens and veggies and the meat had the most delicate flavor. * Double Mountain Vaporizer, dry hopped and cask conditioned. He said this might now be his favorite beer ever. That’s saying something, people! Full, happy, sun toasted and exhausted, we rang the bell on our first full day of Portland vacation. Stay tuned for more good eats during the rest of our time in the City of Roses!